Beauty and the Gamer: 50 Followers Giveaway! Hi Everyone! Welcome to my first ever giveaway! I hit a milestone (at least in my eyes ;P) of 50 followers! I just wanted to say thank you to my followers - new and old. I hope that I have picked some great items that you'll all like! 1. Must be 18 or older. If you are younger, please make sure you obtain your parents permission to give out your address - PLEASE! 3. Must follow via GFC - I will check! 4. I have 2 mandatory questions, if you do not wish to leave your email address, please let me know by commenting below and email me @ jjquan@hotmail.com. PS. This is my first time playing around with Rafflecopter, so I hope that everything works out okay!!! I will be picking a winner on May 30 and announcing it on my May 31. The winner will have 48 hours to get back to me before I pick another winner. Congrats lovely lady! I entered and will tweet it out for you! One makeup product that I could not live without is eyeliner! Oooh...that's a good one! Thanks for entering and good luck! The one beauty product I could not live without is foundation or BB cream. I couldn't live without concealer- thanks to my darn acne prone skin! grrr. Congrats Jamie- this is an amazing giveaway! I think that would be my number one product too. double GRRRRR!!!! Thanks for the kind words (on your blog) and good luck! I could not live without lip balm! My one beauty product that I could not live without is Evian Facial Spray! It's a must-have for me all year! Thank you for stopping by my blog, I am definitely following back! I still remember being your first follower! I just thought your blog was so awesome and honest! Well-deserved achievement girl!!! Ooh, I didn't answer the blog question...ummm I can't live without lip balm or SOMETHING on my lips. I will lick them into oblivion if I don't have anything on them! I would lick my lips to oblivion too!!!! LOL! - Blog post comment made. I will also tweet your giveaway! I could not live without false lashes. I am so surprised I have never seen your blog before! I also just read about it on Canadian Beauty Reviews. Anyways, I love it and am certainly a follower now! One beauty product I can't live without is lipstick! I cannot live without moisturizer! Thanks for following back! I did enter your awesome giveaway! Awesome giveaway, I also found your blog through Canadian Beauty Reviews. Congrats on your 50+ followers! I can't live without my lipstick palettes. I depotted all of my lipsticks into two containers that sorta look like the Makeup Forever Flash Palette - it has 12 squares and its from muji! What a smart idea!!! You know, I need to look into Muji, I've heard nothing but awesome things about this storage! Thanks for stopping by and good luck! 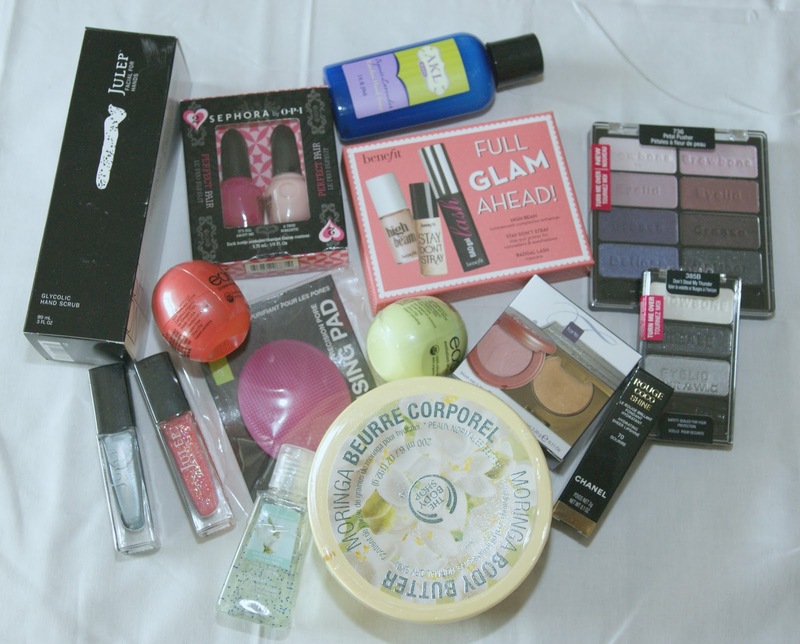 Lipbalm definately ranks waaaayyyy up there for me - hence I'm giving away two EOS lipbalms!!! hee hee! Thanks for stopping by! I followed you back! Thanks for following! Followed you back! Yay congrats! im a closet gamer also... I love the Sims! been playing 10years and counting. Hi, congrats on 50 followers! I couldn't live without mascara! Hi! i'm a new follower and YAY for a fellow Albertan!!! and i would not be able to live without eyeliner! amazing giveaway one make up product I can't live without is my BadGal Lash mascara by Benefit! Mascara... I feel naked with out it! Thanks for following on GFC as well! if it had to be absolutely one this it would be foundation. I need that stuff. congrats and what an AWESOME giveaway!!! My MUA Brown Eyeliner, It maybe Cheap but it works for me! I wish that we had MUA in Canada. It looks like pretty awesome stuff! I'm not going to enter b/c that would be pretty brutal if I won. However... you could drive the prize to my house! Good give away tho! I can't live without my naked palette! I can't leave with some sort of face base - foundation or bb cream! I found your blog last night after being intrigued by your GFC name, and I love it. I spent ages reading back. I couldn't live without Rimmel Stay Matte Powder. Congrats! As I see a new bigger milestone's coming :) Sparkly congrats for that! I can't live without fruit-flavoured lip balms (don't name a band 'cause I always change them :)) and almond body butter :))) hmm, yummy things! Wow, I'm SO excited to have found your blog via Canadian Beauty Reviews! It's wonderful. Thanks for the chance to win so many awesome goodies! Oh, and I couldn't live without mascara...it makes tired eyes (and mine *always* look tired) look instantly awake! I can't live without moisturizer! I have oily skin, so face wash is a must. One makeup item I can't do without is black eyeliner. I couldn't live without my foundation! Thank you so much for this kind giveaway and congrats on your 50++ (137!) followers! The one thing I couldn't live without is Hypnose by Lancome - amazing mascara!! It's a combo - lash curlers and a good mascara!!! I couldn't live without lipbalm! I could not live without lipstick!